This is a comment I just recently gave to a post by Danny about last night's Debate. Just like I always say to you, Danny, Politics is just an alternative sport to watch. 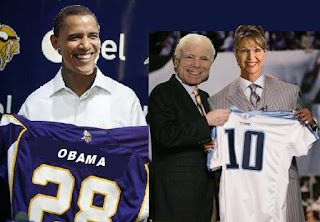 I heard a guy on CNN talking about McCain and Obama “getting ready” and “practicing” for their next “face-off.” They even have “watch parties” where people wear their “team colors” and watch the big debate. I half expect to see Republican or Democrat beer helmets and big foam fingers. I wonder if McCain already has his touchdown/victory dance figured out. Both candidates should call Terrell Owens for suggestions on what to do when they win. To be honest I’d switch to baseball too. Politics is kind of a slow sport. The season lasts like over a year and only takes place every four years. The championship takes up like half the season and there are only two divisions. The team that wins gets to sit in the victory circle (or in this case the victory oval) for four years before anyone gets to challenge the title and every team wears the same uniform. It would spice things up if they let the communist party or even the Nazi party get in on the action and everyone had a uniform or some spandex. Joe Biden and Sarah Palin debating with Fidel Castro in Spandex… picture it. What is interesting though is the draft… Notice that this year both teams are depending on a strong rookie to carry the team. Obama, the rookie out of Illinois, is turning out like Adrian Petersen in his rookie season. He’s carrying the team but victory is never certain while Palin, the first rounder out of Alaska, could still come out on top but looks a bit shaky, like Vince Young, she might have to sit the bench and let the veteran try to muster up some big plays. The republicans are like the Patriots, they have been dominant for the last eight years but without Tom Brady I don’t think they have a chance (maybe Tom Brady should step in as McCain’s running mate). Whichever way it goes, I’ll be alright. I’ve got Bill Clinton on my Fantasy team. haha! that last line cracked me up!